From the kitchen of One Perfect Bite...Years ago these were served as hors d'oeuvres. I've never thought that anything deep fried tastes like much unless it's served really hot, so I never bothered with them. When we were in China these were served with soups and I had to rethink the position I'd taken. When properly made and served quickly these are delicious. If you're looking for something a little different to serve for lunch you might want to give these a try. A food processor makes their assembly quick work. 1) Place shrimp, ginger, sesame oil, rice wine, and egg white in a food processor and pulse until a coarse purée forms; transfer to a bowl. Stir in waterchestnuts, cilantro, scallions, and salt and pepper to taste. 2) Heat 2 inches vegetable oil in a 3-quart saucepan over moderately high heat until it registers 375 degrees F. on deep-fat thermometer. 3) While oil heats, divide shrimp spread among bread slices (about 2 tablespoons per slice) and spread evenly to edges. Sprinkle with sesame seeds, then gently press seeds into shrimp spread to make them stick. 4) Fry 2 bread slices, shrimp sides down, until shrimp is browned, about 1 minute. Turn over and fry until undersides are golden, about 30 seconds. Transfer to paper towels to drain. Fry remaining slices in same manner. Cut each toast diagonally into 2 triangles and serve immediately. Yield: 6 servings. Recipe adapted from the Gourmet Cookbook courtesy of Ming Tsai. Mmmm....I can nearly smell it from here, ha ha!! I love a good, hot shrimp toast. These look really yummy! I'm imagining these are just bliss! What an interesting appetizer. The shrimp sounds flavored wonderfully. We've been gone -- I have a lot of "Bites" to catch up with! Yum! I bet those are delicious, especially w. the sesame seeds! wow..these seriously look so mouth-watering! This looks interesting. 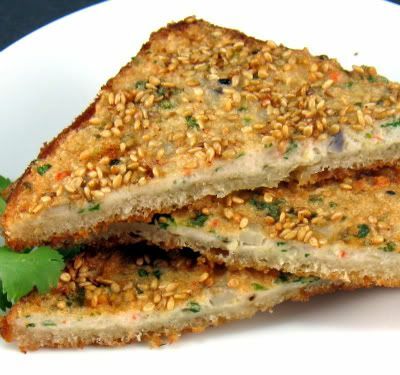 I've not had shrimp toast with plain bread before...I'm going to do a variation if that's okay with you. Yummmm, all my favorite flavors. I've never made this but looks so good I have to give it a try. This would be perfect with a lovely summer salad. Hello Mary, I love all your recipes. Thank you so much for sharing. Thanks for visiting mine too. I will add your blog to my site. I really enjoy. I don't think I've had anything quite like these before but I can tell by the list of ingredients and your lovely photo that I would love it! toast looks delicious & easy to make. These look delicious and something different to serve at a lunch with friends. I havent had shrimp toasts in so many years. I wish I could get up the nerve to go ahead and fry some. Yes, it's all about piping hot deep-fried stuff, otherwise you just taste the greasy batter! Yummy! I can't wait to try these at my next dinner party! These just jump off the page. I love shrimp toast, but haven't had it in years. Let's see, I have some shrimp in the freezer . . . . I have seen versions of these before, but have never tried them. They look delicious! Hello Mary, thank you so much for stopping by. I'm still making my Blue Monday visits. All your recipes look sooooo yummy. egg. Just make sure to keep the oil at the proper temp to keep the toast from absorbing the oil. Mary, I saw shrimp toasts being made also on Food Network Canada....love the idea and many takes can be made with it. Yours look fab (of course). I need to give this recipe a try. When I was younger we had one Chinese restaurant in town. It was a nice sit down place with a varied menu. They had dishes I just don't see these days at the chinese restaurants I have available. One of my favorite things to get was their shrimp toast. Yours looks very similar. Thanks for sharing! I have been wanting to try shrimp toast for a while. It looks and sounds so good!